Functional and stylish display shelving systems deliver huge impacts not only in retail environments but also in the home. In this blog we detail three spaces with extreme attention to display strategy. Our first featured space is from one of Portland, Oregon’s hottest retail shops, CANOE. The second featured installation is a thoughtful home office space from the Boston area. 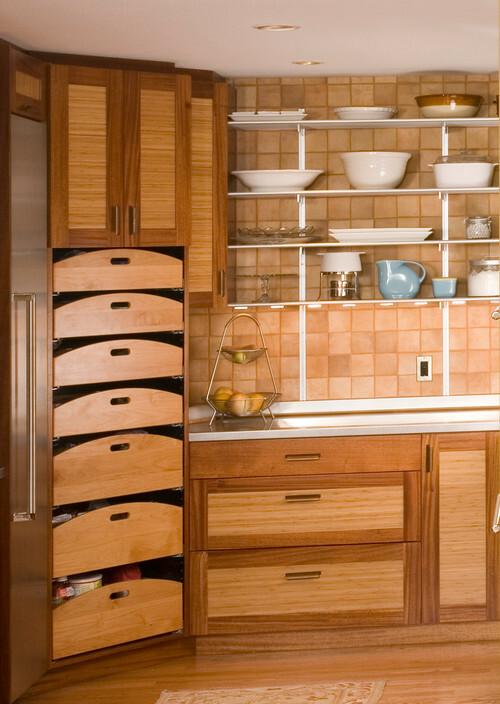 Finally, we feature an eclectic pantry from Seattle with plenty of display storage space by Richard Landon Design. Located in the vibrant West End of Portland, Oregon, CANOE sets the standard for timeless yet functional objets d’art. Similarly to their mission of transcending short-term trends, CANOE utilizes Rakks Brackets and Standards, providing timeless styling and maximum merchandise visibility. CANOE designed displays using Rakks Brackets with “C” Style Standards. Unlike many retail shops, they don’t set up elaborate vignettes or crowd the products – they favor a very clean, uncluttered approach that lets the products speak for themselves. Be sure to visit CANOE whenever you’re in “Bridgetown”, or visit their online shop. This Boston area home owned by Camilla, founder of Eastcoast Scandinavian – a DIY blog featuring spaces from all over the country, includes a living room wall with over 40 feet of sturdy shelving space in a compact area. Utilizing Rakks Brackets and Standards with oak planks from a local supplier (Anderson Mcquaid), Camilla created a custom display shelving system. Camilla also designed a home office for her husband using a Rakks Shelving System. In this case, Camilla and her father used oak planks from Home Depot as shelving spans and IKEA butcher blocks as the desk surface for her husband’s home office. The butcher blocks are supported by Rakks T-Style Brackets, used to support work-surfaces from 20″-24” deep – they are reinforced for added strength and are rated at 120 lbs per bracket. Richard Landon Design designed a “working pantry” to accommodate the varying amount family and guests for a clients home. The exquisite woodwork, highlighted by the arched drawer pullouts, suggest storage is incredibly important in the pantry. White wall mounted standards are installed on full-tiled walls, providing plenty of hearty storage space for large kitchenware. Rakks Standards hold matching white Rakks Brackets to support the four tiers of shelving spans.